Marilyn Cornwell Blog: Where's Fido? There are well-know dog names - Fido, Rover and Spot. Where do these names come from - particularly Fido? Here's a case on not remembering much Latin from Grade 10 Latin class. Fido means "to trust, believe, confide in". Did you ever meet a dog named Fido? If you had known Abraham Lincoln, you would have met his 'faithful' dog Fido, always by his side. It was in 1941, when Fido became one of the best known dogs in Italy, and then around the world. This dog came to public attention in 1943 because of his demonstration of unwavering loyalty to his dead owner. Fido was a rescue dog brought back to health by Soriano. They would go to the bus stop each day and Fido would watch Soriano board the bus for his job. Fido would stay in the town square for the day, and be there at the end of the day to greet his friend at the bus stop. However, this was during the second world war, and one day Soriano did not return - the factory had been bombed. Fido waited and waited for Soriano on the day of Soriano's death, and then finally went home. He returned every day for fourteen years - watching and sniffing the air, waiting for Soriano. Soon Fido's unwavering loyalty became widely known. Magazines ran stories of Fido, movies were made, and he was awarded a gold medal. Even Time Magazine covered Fido in 1957. He had his own sculpture created "Monument to the dog Fido" - this was during his lifetime - he was famous and revered. When Fido died in 1958, his obituary was in the paper, and he was buried near his owner. Are there other dogs with such remarkable stories? Yes - there are at least three who are famous for similar reasons - the Japanese dog Hachiko, the American Shep, and the Scottish Greyfriars Bobby. 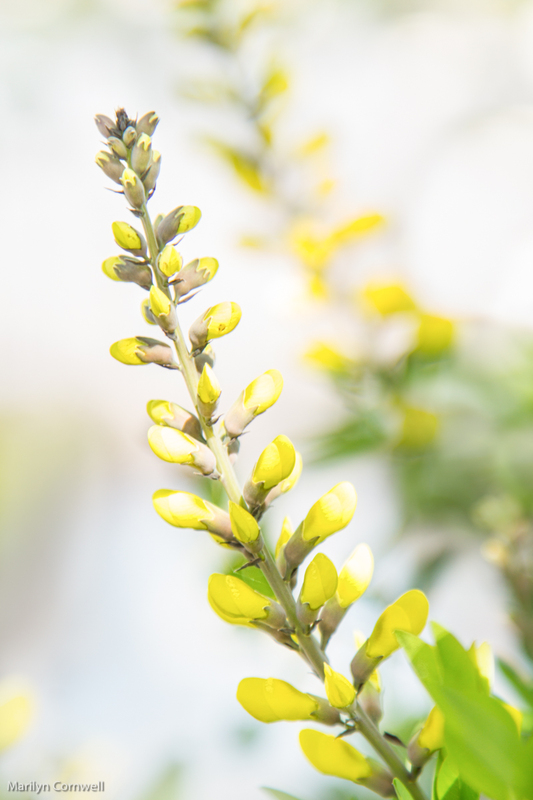 Today's picture is a yellow Baptisia blooming in the Sunshine Express greenhouses.